Note that this is an exact copy of the instructions included with the bar, including the bizarre punctuation. I've copied them here for historical purposes as the bars are no longer produced and people buying them second hand may find it difficult to find the originally installation instructions. 3/8 inch = 20-30 ft.lbs. 7/16 inch = 35-45 ft.lbs. 1/2 inch = 50-70 ft.lbs. 9/16 inch = 70-90 ft.lbs. Place the concave bent plates into the holes in the rear axle beam closest to the tires so the bend is downward in the middle, see diagrams. Move any lines, wires, or hoses as needed. Place the large D-shaped bushings onto the bar and align with the concaved plates in the axle beam. 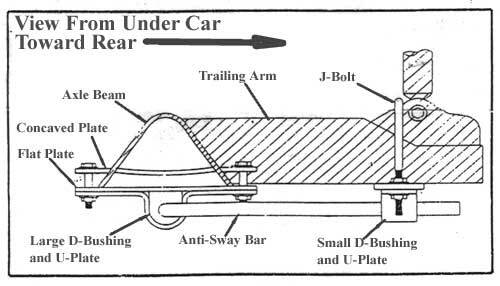 Place the large u-plates over the D-bushings, attach the bar to the axle beam with the flat plates at the bottom of the axle beam as per the diagrams, use the longer bolts, flat washers, and locknuts provided, leave loose at this time. Locate the open hole in the bottom of the spindle mount near the tire, insert the shorter bolt and washer from the inside so the threads extend out of this hole and point downward toward the tire. Attach the large bent angle bracket to this bolt and attach with the washers and locknuts provided, leave loose at this time. See diagrams. Hook the J-bolt onto the shock mount just forward of the lower shock mount bolt, align so the threads go thorugh the large angle bracket and extend downward. Place the small D-shaped bushings onto the ends of the bar and align with the large angle brackets, place the small u-plates over the bushings and on to the J-bolt threads. Use the remaining bolts, washers and locknuts to attach the small u-plates to the bottom of the angle brackets, leave loose at this time. Adjust the mounting hardware so the bar is as centered as possible, torque the axle beam mounting bolts to the specified rate. Torque the small bolts at both ends of the large angle brackets next. Last torque the j-bolt locknuts. Bounce the vehicle checking for clearance on all undercarriage components, brake lines, fuel hoses, wires etc.. Test drive the vehicle and recheck the bars alignment and clearances. Recheck periodically on a regular basis. A scan of the original instruction sheet is available here in TIFF format. You might want to right-click and Save-Target-As since QuickTime seems to want to open it on my system and just freezes.